This area of the web-book provides an avenue for publicizing new and significant Seated dime die varieties or die states. The presentation of information will be ad hoc, dependent on the significance of the variety or new die state, the quality of the obtainable photography and available time I have for commentaries. Please understand that variety discoveries on low grade coins, low grade being Fine or lower, can be difficult to validate and are typically not included in the web-book. 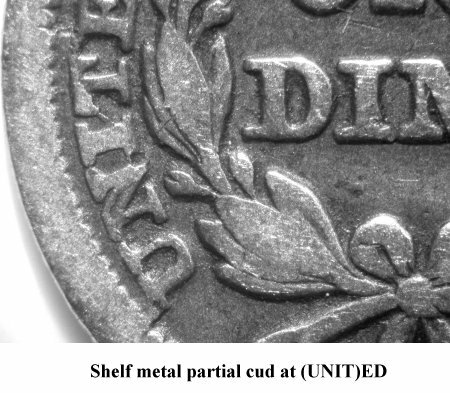 Circulation wear and contact marks can affect a coin's surface and design elements, often leading to difficulties with the validation of a new variety. The author will have the final decision on the inclusion and publicity of new varieties at this link. Liberty Seated Collector Club members are also encouraged to publish new die variety discoveries in the Gobrecht Journal or the E-Gobrecht. You are invited to examine the Liberty Seated Collectors Club link for contact information. How does a collector submit a potential variety discovery for inclusion into the www.SeatedDimeVarieties.com web-book? Please contact Gerry Fortin directly at wuximems@hotmail.com and explain the nature of the new variety consistent with the methods employed in the web-book. I will confirm with you and request that the new Seated dime variety be sent via insured mail to 225 Valley Rd., Raymond, Maine 04071 for verification and photography. Please include monies for return postage and insurance. The turn around time for review of potential new varieties could be variable due to backlog and available personal time away from Rare American Coins business demands. Click on variety images to access the individual web-book pages for that variety. At the October 2015 Rochester Numismatic Association coin show, the author was approached by Brian Treitley concerning an 1875-CC In Wreath dime with large retained cud on the reverse. Quick attribution revealed the die pairing to be F-113 in terminal die state. The reverse die is completely shattered in the lower right wreath and the missing die segment results in a large retained cud at 3:30 down through 5:00. This terminal die state is designated as 1875-CC In Wreath F-113c. 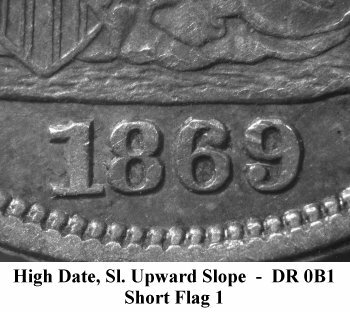 During November 2015, Dr. Tim Cook identified a second reverse die pairing for the 1877 Carson City obverse with misplaced 7 digit in the denticles. Obverse 13 is in a later die state during the die pairing with a lapped reverse die that has well centered mintmark. This new reverse die is designation as Reverse O. During the die pairing, Obverse 13 has a heavy die clash mark behind the date digits which should be useful for future tracking and diagnostics. 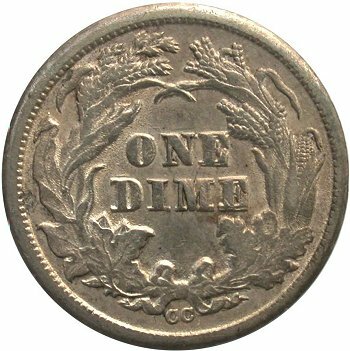 Dr. Tim Cook continues his Liberty Seated dime scrutiny for new die varieties among the common dates. His search identified the sixth die pair for 1876 Type II reverse dies. This new die pairing is straigthforward to identify by the obverse die. There is a large die defect near the upper right top point of the shield. This die defect is surrounded by small die pits. This latest Type II reverse die variety is listed as F-106. Keep up the good work Tim Cook! Dr. Tim Cook has found another important variety; this time an 1876-S dime with bold repunching below the 1 and 8 digits in the date. The repunching is easily seen with a 10x loupe. Below the base of the 1 digit, there is a long extension of the vertical segment while below the left lower loop of the 8 digit, there is a clear secondary loop. This new variety is listed as F-122. During late July 2015, Ken Rubin contacted the author concerning an 1851 New Orleans dime purchased in PCGS AU50 with completely missing Star 7. 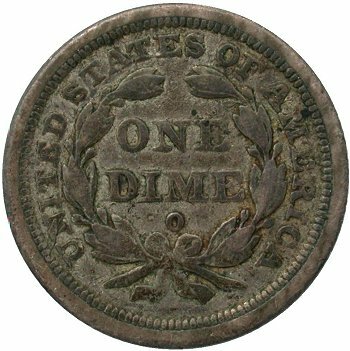 His concern was that a Chinese counterfeit might be at hand a no 1851-O dimes were known with a missing Star 7. The coin in question was shipped for study. Inspection clearly indicated the Seated dime in question was genuine. The missing Star 7 was the result of a minting error; most likely a greased filled die for a short period of time. The fact that Star 6 and Liberty's facial details are not disburbed is amazing. The foreign material that filled the Star 7 crevice on the die was localized leaving only a faint impression of the star at top most point. Though the missing Star 7 event is technically an minting error, it is no different that reverse die rotations events and is assigned its own webpage and die suffix for publication purposes. A high grade 1875-CC In Wreath F-112c dime surfaced during July 2015 and was acquired by Gerry Fortin Rare Coins. 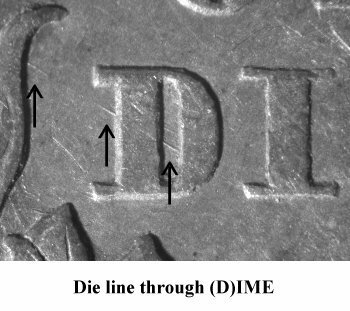 Minimum wear on the piece allowed for detailed mapping of the reverse die cracks immediately before the die shattered leaving a partial cud with shelf metal. I've chosen to list this piece and the Tim Cook discovery die state example together as there is little difference other than the shelf metal surrounding the partial cud. An emission sequence for Reverse H with all known 1875 In Wreath die marriages is currently mapped as Obverse 3-H, Obverse 10-H, Obverse 13-H, Obverse 3-H.2, Obverse 12-H.3, Obverse 5-H.3, then Obverse 3-H.4 as the final terminal shattered state. Amazing stuff indeed! A new reverse die for the 1884 San Francisco date was discovered by a Heritage cataloguer during lot preparations for the June 2015 Long Beach auction. Lot 3483 was described as, "1884-S 10C MS63 NGC. Fortin-Unlisted. Fortin's obverse 2 is paired to an unlisted tail die. The reverse is in a perfect die state and is fully prooflike, with the mintmark perfectly centered between the ribbon ends. The obverse is frosty with mild abrasions. A bold strike and light golden toning ensure strong eye appeal." The new reverse is labeled as Reverse D.
The mintmark was deeply punched on Reverse D as the appearance is bold and well centered while filling a substantial amount of the space between ribbon ends. This reverse die is also well polished producing proof like fields while Obverse 2 surfaces are frosty. A rarity rating of R6 is initially assigned given the amount of scrutiny this branch mint date has received since the web-book was released in 2004. When attributing a group of purchased Seated dime at Gerry Fortin Rare Coins, the author located this incremental 1876 Carson City die pair. Both the obverse and reverse dies are new to the author with distinct diagnostic points. Date punch placement is measured as DR 0B1 and is positioned lower than on other obverse dies with the same DR measurement. There is a long diagonal die scratch on the obverse die that us usable as diagnostic marker. The reverse die features a weak mintmark that is perfectly level within the ribbon ends. With 10x loupe, a die defect can be seen on the upright of the left C mintmark. Dr. Tim Cook identified a cool 1852 dime with significant obverse rim die cud by Star 1 during during September 2014. The associated reverse is cracked throughout the lower legend and across the ribbon ends into right stem. Date placement on this obverse die is very similar to that of Obverse 11, the proof only obverse die. 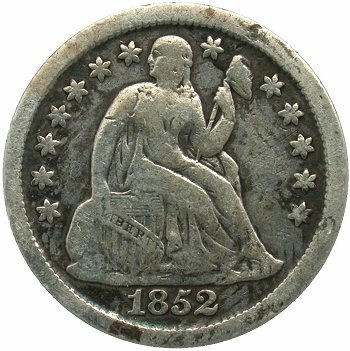 However careful review of Heritage Auction 1852 proof dime images along with this piece in hand failed to reveal any definitely markers that could provide a positive match. The variety is listed as F-118 with Obverse 14 and Reverse R until more research shows otherwise. The eigth 1861 Type I obverse die was discovered at the October 2014 Denver Expo by the author. This new obverse is also paired with a new reverse die (I). The primary obverse diagnostic is a date punch positioned far right with Denticle Ruler measurement 2L. There are several regions of horizontal die polished lines; immediate to the right of Liberty's right arm and also behind the date digits (see images above). Bold die scratches are also seen in the shield at random diagonal angles. Reverse I die is well hubbed with bold lettering in the denomination as compared to most other 1861 Type I reverse dies. A die scratch in the upper left wreath as shown above provides a unique diagnostic for Reverse I.
I recently purchased a very well struck 1873 No Arrows Open 3 dime on eBay. One of the considerations for purchase was the bold obverse date near the base that is atypical for Open 3 dimes. When the dime arrived, I was able to confirm an unlisted obverse die based on date placement, the thick feet on the 1 digit and the partial (S)TATES and have now included in the web-book as F-106. Obverse 4 has similar date placement as Obverse 1; both have Denticle Ruler measurements of DR 0B1 which can cause difficulties with attributions. Please note that the date punch on Obverse 4 is higher or closer to the base than Obverse 1. Please see the F-106 webpage for a comparison of Obverse 4 and Obverse 1 date placements. At the August 2014 ANA convention, Harry Smith provided an 1849 New Orleans dime with reverse rotated of 105 degrees left. A review of date punch position confirm the dime to be struck with the Obverse 2 and Reverse B die pair and presents another rotated reverse position for the F-103 variety. From this example, it can be concluded that the obverse hammer die became free of its set screw and rotated for an unknown number of strikes. More attention and research is needed to locate additional reverse rotation positions. On the morning of September 23, I received an email from John Dannreuther indicating the discovery of a third proof obverse die for the 1881 date. We immediately chatted via phone with John sharing his supporting research for the new variety. The incremental proof variety is labeled as F-103 and features an obverse with date positioned far right as compared to F-101 and F-102. John kindly shared his research from the National Archives and presented the following quarterly proof mintage amounts during 1881; January/March - 675, April/June - 50, July/September - 0, October/December - 460. Based on the National Archive information, it is highly likely that the F-103 proofs were struck during the second quarter of 1881 with a mintage of 50 pieces. An initial rarity rating of R6+ is set due to the inherent high survival rate for Seated dime proof strikes. F-103 proof mintage is limited but the high survival rate will allow more specimens to enter the market over an extended period of time. Regardless, the 1881 proof F-103 variety will be challenging and a prize acquisition for advanced Liberty Seated dime collectors. 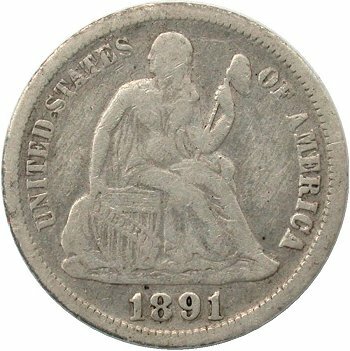 At the August 2014 ANA convention, Scott Grieb provided several nice Seated dimes for evaluation including this 1891-O dated piece. After careful review of existing die varieties, I determined that this piece was struck from an unlisted die pair. On the obverse, there are three rim cuds at 12:00, 4:00 and 10:00. The date punch is bold with well defined digits and upward slope. There are die cracks throughout the obverse and it is also heavily clashed. The reverse features a spider web of die cracks with at least six rim exit points. There is a bold raised metal cud on the corn ear in right wreath. Attempting to diagnose this reverse by mintmark placement alone will be challenging as the mintmark is well centered between the two ribbon ends. During the F-102a die state, 1891-O Obverse 1 exhibits two sets of die clashing marks that are slightly offset. This offset is due to differences in reverse die rotational misalignment with respect to the obverse. Since Obverse 1 was clashed twice with two reverse dies, the slight difference in reverse alignment can be seen as an offset in the obverse clash marks. Reverse B is also clashed and shows a die crack from the left ribbon end into the mintmark. This is a spectacular late die state and a representative outcome of the high striking force used to coin 1891 New Orleans dimes. The author had not seen an F-102a specimen until Scott Grieb offered this example at the 2014 World's Fair of Money show. Once having Scott's specimen in hand, the double clashing event on Obverse 1 was comprehended and properly documented here. A new 1887-S die pairing was identified during early August 2014. Obverse 8 and Reverse L are seen in a new die pairing with Reverse L exhibiting a substantial amount of device details. Obverse 8 can be diagnosed by date position and the weak base above the 887 digits. This new variety was discovered within Gerry Fortin Rare Coins inventory and is labeled as F-121. A second proof 1887 die was listed by Breen but not verified by the author until George Huber from Heritage Rare Coins made an astute observation that the Eugene Gardner 1887 NGC PF67 dime lacked the obvious F-101 diagnostics. Furthermore, the Gardner specimen exhibited weak gown lines above the shield as listed in Breen-2. Careful study by the author did confirm that the Gardner proof dime was struck from a different obverse die than F-101 and those diagnostics matched the Breen description. On proof Obverse 17, the date punched is measured as DR 0C with die lines behind the 88 digits. One horizontal die line connects the midsections of the two 8s, and a second appears inside the bottom loop of the second 8. Circular die lines (probably unpolished lathe lines) appear in the gown between two legs to the left of the C in AMERICA; also the gown lines above IB in LIBERTY are weaker than F-101. 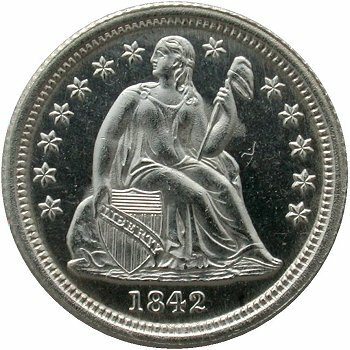 During June 2014, an additional 1858 Variety 108a surfaced at a Midwest coin show. Interestingly, this specimen exhibits a rotated reverse left measured at 57 degrees. This is 12 degree more than previously documented for Variety 108a. This new example is listed as Variety 108ab to capture the incremental reverse rotation. It might be assumed that a loose hammer die (obverse) without adequate set screw retention may have rotated during the striking of Variety 108 coinage. More research is required to determine if Varieties 108 and 108a (rotated reverse) can be located with a full range of reverse rotation from normal coin turn die alignment to the presently known 57 degree condition. An 1849-O Large dime has been identified with the reverse die rotated left by 34 degrees. This new reverse rotations is labeled as F-101ab. As is the case with Variety 101a and its 52 degrees left rotation, there are no die cracks on the reverse die therefore suggesting that the improper die alignment occurred early during the die pairing. Gene Gress of JJ Teaparty is credited with the discovery of this second reverse rotation. Given the fact that 52 degree and 34 degree left rotation specimens are known for the Large O die pair, one must assume that the hammer die (obverse) became free of its set screw and moved during an unknown amount of strikes. More research is warranted to locate specimens that would exhibit reverse rotation other than 52 and 34 degrees to confirm a loose hammer die theory. Variety 104 results from the first pairing of Obverse 3 and Reverse D dies. During this die pairing the reverse die is rotated right by 6 degrees. 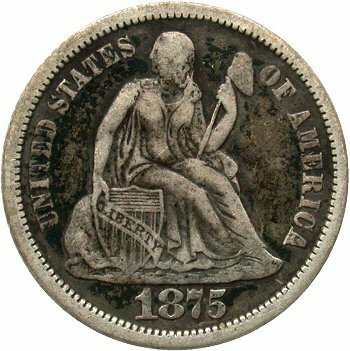 The Micro S mintmark is weakly struck resulting in a "filled" appearance consistent with nearly all Micro S dimes struck during 1875. Obverse 3 and Reverse D are paired for a second time and dimes struck from the second die pairing are listed as Variety 104a and feature reverse die rotation of 18 degrees right. Of most significance, is the occurrence of an "unfilled" Micro S mintmark on Reverse D during the second die pairing. This unfilled Micro S mintmark variety is rare and rated as R6 in grades of VF or better. At the May 2014 Denver Coin Expo, a second example (as known to me) of the 1865-S F-101a sub variety surfaced in original EF45 grade and is illustrated above. This dime exhibits the same obverse depression below the shield as on the Greer variety plate coin. However, a closer examination of the reverse also revealed a second depression on maple leaf in the lower left wreath directly below (D)IME. 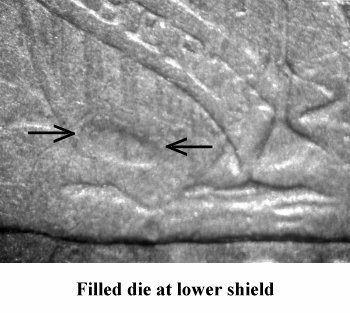 This smaller depression is also visible on the Greer plate coin but not identified during prior review and publishing. This sub variety is definitely is well served by an R7 rarity rating as very rare. Mintage from the Obverse 3 and Reverse E die pair will be found in well struck and highly detailed condition through the full continuum of poorly defined late die state examples. Variety 105a is used to designate those strikes with significant loss of device details including fully effaced reverse denticles. On these late die state examples the obverse legend and denticles are also weak. Grading late die states examples will be challenging due to lack of device details that could be misattributed to wear rather than strikes. The above plate coin is the latest die state seen by the author and used for illustrating the nearly terminal die condition for the popular Medium S / Small S variety. Tim Cook sent along another unlisted 1875 Carson City In Wreath die state for consideration and addition to the web-book. This dime has an obvious partial cud on the reverse between 3:00 and 4:30. The left ribbon end is effaced therefore it is easily determined that this another Reverse H die state. 1875-CC In Wreath Reverse H is in a terminal die state with a partial cud present between 3:00 and 4:30. Interestingly, Reverse H is not consistently paired with Obverse 3 between the Variety 112b and 112c die states. Instead, the Carson City mint workers paired Reverse H during its H.3 die state with Obverse 5 and Obverse 12. Upon further degradation, Reverse H is once again paired with Obverse 3 to produce limited coinage since the reverse die is essentially shattered. An emission sequence for Reverse H with die states is currently mapped as Obverse 3-H, Obverse 10-H, Obverse 13-H, Obverse 3-H.2, Obverse 12-H.3, Obverse 5-H.3, then Obverse 3-H.4 before completely shattered. 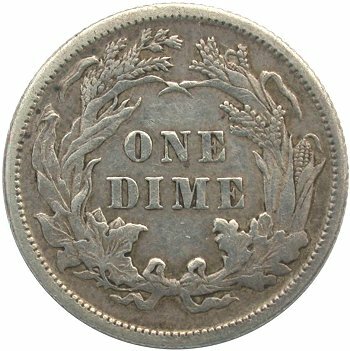 Tim Cook submits an 1890-S dime that took consider research to properly attributre . The obverse is straightforward and labeled as Obverse 13. It is in a very early die state and is easily identified by a date punched with DR measurement of -1B0. This date punch is the furthest left of all 1890-S dies. The obverse area above and to the right of the shield is heavily polished and lacks details. Obverse 13 is paired with a lapped reverse die. Based on the Medium S mintmark position and tilt and faint die crack to the left of the mintmark, it is proven that Reverse M was lapped before being paired with Obverse 13. The die lapping removed the left ribbon end and portions of a maple leaf in the lower left wreath. Additional device weakness is seen in the corn ear on the right wreath. There are die cracks in the areas where lower wreath device details are effaced. This incremental 1890 San Francisco obverse was identified by Dr. Tim Cook during late 2013 and submitted for publication in early 2014. Considering the amount of research conducted for this date in the past 15-20 years, it is surprising to have a new obverse die paired with a significantly polished reverse die appearing at this point in time. Examples with the date punch being furthest left should have been detected early on. An initial rarity rating of R6+ is assigned to this die pairing variety and will be adjusted based on incremental pieces surfacing or the lack there of. Gerry Fortin Rare Coins recently took in a consignment with high grade 1875-S Below Wreath dime. When attempting to attribute the piece, new obverse and reverse dies were identified with the reverse die being shattered. Most 1875-S Below Wreath dimes come with badly eroded reverse dies or are weakly struck. In the case of new variety F-122, the obverse and reverse dies are well hubbed and not eroded resulting in a bold strike. Reverse T is shattered with numerous die cracks throughout the wreath elements and bow knot. The above die crack mapping captures all visible die cracks on the plate coin. There are at least nine rim exit points for the various die cracks. The Small S mintmark is well centered in the vertical plane and nearly centered horizontally. I have chosen to label this mintmark position as [mm C,C] as a result. At the February 2014 Atlanta ANA show, Jason Feldman shared an 1839 dime with reverse rotated left by 90 degrees. This dime came as a complete surprise. Careful study revealed the dime to be struck from the Obverse 3 and Reverse F die pair which were re-used for business strike coinage after several proof strikes. The initial few production strikes seen have the obverse and reverse in normal coin turn die alignment. The typical business strikes die alignment from this die is reverse die rotated left 18 or 23 degrees. On this piece, Obverse 3 exhibits its primary diagnostics including a date punch position measurement of DR -2L and repunching on Star 8. There is no die crack from rim to Liberty's head which confirms an early Obverse 3 die state during this 90 degree rotated reverse event. Given the early obverse die state, it must be assumed that this piece was struck between the timeframe of normal coin turn die alignment and later business strikes with obverse die crack through the head and reverse die rotation left of 18 or 23 degrees. The discovery of this lone example in low circulated grade raises important questions. Is the 180 degree medal turn die alignment an intentional decision by mint officials to strike special pieces with medal turn die alignment? Or is this reverse rotation the result of further rotational movement of the hammer die? Variety 107a die state clearly indicates that a few examples of the Obverse 5 and Reverse F die pair were struck with 120 degree rotational misalignment. It is possible that this example results from ongoing movement of the hammer die. To prove this latter theory true, additional Variety 107 examples with alternate reverse rotations need to be discovered. The first known example of the 1890 variety with misplaced digits in the lower shield and a reverse retained cud was located during February 2014 at a small Sarasota coin show. The obverse is in a similar die state to Variety 108 with the misplaced tops of 9 and 0 digits still visible in the lower shield. 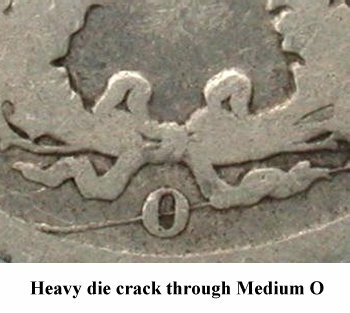 The reverse also has similar strength die cracks as during the early die state illustrated for Variety 108. The difference is a complete die break and retained cud at 11:00 which suggests that the reverse die suffered a sudden terminal die state event and was removed from production. The 1876-CC F-112 variety has been a favorite seen purchasing the initial specimen in the mid 1990s. For years, I searched for another example and finally located one during 2013 in a PCGS EF Details holder. This second example also exhibited reverse rotation of 45 degrees right. A third Variety 112 example was purchased at a small West Coast Florida show during February 2014. This specimen however exhibits reverse rotation of 65 degrees right rather than 45 degrees seen on the prior two specimens. The reverse appearance, with poorly defined right wreath devices, continues to match that seen on the discovery coin. The obverse is struck slightly off center. I believe the obverse is the hammer die while the reverse is the anvil die. Careful study of this piece suggest that the coinage press was not properly calibrated as the strike is uneven with respect to horizontal plane from left to right on the reverse. Even though I show the reverse as being rotated in above images, I believe the rotation issue is caused by an improper setup of the hammer die from a rotational perspective. I also believe that the anvil die had a planarity setup issue. Since few examples of Variety 112 are known, it is likely that the press operator noticed the poor striking quality and terminated production quickly after the erroneous press setup leaving a few specimens to enter circulation. This variety is rated as R7 in original VF or better condition. Update: At the February 2014 Atlanta ANA, Jason Feldman provided a second example with 65 degree rotation and indicates locating this dime at the 2011 Winter FUN show. For the 1874 With Arrows F-102a late die state obverse die, a previously unlisted faint misplaced top of 8 digit has been identified between the final 8 digit and the bottom of the base. One could argue that this is a repunching artifact but the distance from the final 8 digit punch to the top of the extra 8 suggests a misplaced digit designation may be appropriate. Interestingly, I did not see this faint 8 digit top loop with normal 16x loupe. The discovery was made during macro photography of the die crack through the date digits. The extra top of 8 digit became obvious in the view finder. 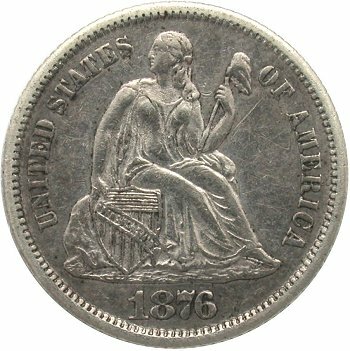 F-121 presents the third 1876 variety with obvious repunching below the 7 and 6 date digits. For reference, the other two 1876 varieties with repunched 76 digits are F-105 and F-106. Be careful with attributions of Obverse 21 as compared to Obverse 6 as both have the same partial repunching pattern directly below the digit's inner oval. However, Obverse 21 uses a Large Knob 6 date punch while Obverse 6 has a Small Knob 6 punch. Check the new F-121 for detailed comparison of repunching on Obverse 21 and Obverse 6 as the difference is subtle. 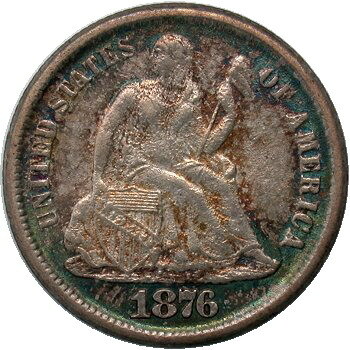 This incremental 1876 repunched date variety is obvious under a loupe and it is surprising that no one has reported an example before this point in time. Several weeks ago, Ed Sims contacted me concerning a mint state 1877 dime that exhibited a shattered reverse die. He was kind enough to send the dime for evaluation and I have added the new die pair (Obverse 15 and Reverse N) to the web-book. Reverse N exhibits circular die cracks throughout the wreath that are typical for 1877 Type II reverse dies. Since Ed's coin is in a later die state, the circular die cracks have progressed with multiple exit points to the rim. The die crack mapping above indicates nine different rim exit points. Die defects are also seen on Reverse N is the lower left wreath. Does anyone else have a With Legend Seated dime with shattered reverse die and more than 9 rim exit points? This 1877 dime will probably be difficult to beat! At the 2013 Winter FUN show, James Smith provided an 1875-S Below Wreath dime with the top of an 8 digit in the denticles. James also pointed out that the die pair was Variety 118 but without the rotated reverse left by 80 degrees as listed in the web-book at that time. James' discovery took considerable time to publish as we revisited the topic during the LSCC meeting at the 2014 Winter FUN show. Your webmaster had forgotten about the dime in his desk; much to his embarrasment. Above is macro image that clearly illustrates the presence of the top of 8 digit in the denticles. This misplaced date punch was not seen on the Variety 118 rotated reverse plate coin from Sean Shaugnessy due to low grade. However, Sean has located a high grade example of the rotated reverse with the misplaced digit in the denticles. James' non rotated reverse dime is listed at F-118 while the rotated reverse die state is now listed as F-118a. I will be posting Sean's high grade F-118a shortly in the web-book. Another 1887-S reverse die is now known to be shattered based on new FUN show finding. The left side of Reverse F is shattered with a partial cud forming between 8:00 - 9:00. The earlier F-106 die cracks between 8:00 and 9:00 in the outer left wreath lead to a partial cud during this later die state. A significant die crack continues from the partial cud along the outer left wreath and exists the rim at 9:30. The edge of the die from 8:00 through 9:30 appears to be ready to disintegrate with further coinage. However, no 1887-S dimes have been reported with a retained cud in this area. I'm surprised that no one has turned up a lower grade example with what appears to be a cud in this area due to wear. Dr. Tim Cook has identified a late die state 1875-S In Wreath dime with shattered reverse and rim cud at 7:30. At least seven rim exit points are documented and illustrated above. Note the dual die cracks at 7:30 exiting to rim and the associated rim cud. This die state is labeled F-102a and listed with separate webpage. Prior to November 2013, the author has not seen an 1839 dime with the reverse die rotated right. Essentially all known 1839 die pairings are found with rotated reverses measured at 12, 18 or 23-24 degrees left. The exception was the Variety 105 die pairing which produced several proof strikes followed by business strikes that eventually lead to the Pie Shattered Obverse (Variety 105c). 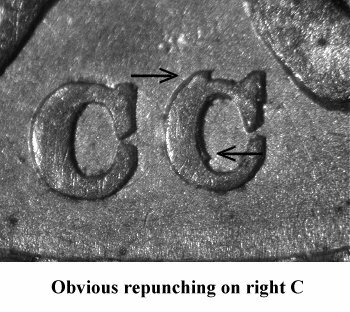 The lack of reverse rotation for the Pie Shattered Obverse was used as an important diagnostic for cherrypicking earlier die states. During October 2013, the author discovered an early die state Variety 106 dime with normal die alignment; this variety is listed as F-106a. During November 2013, an 1839 dime appeared on eBay with a rotated reverse but rotated right 12 degrees! 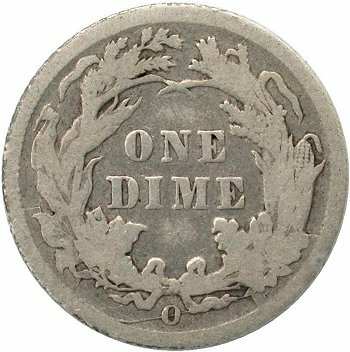 The dime was purchased, attributed and is listed as Variety 109; a die pairing of Obverse 3 with Reverse H.
The reverse rotation during this die pairing is measured at exactly 12 degrees. At the October 2013 Manchester NH coin show (LSCC Seated Dime Fest), Jack White approached me with the above AU50 plate coin. 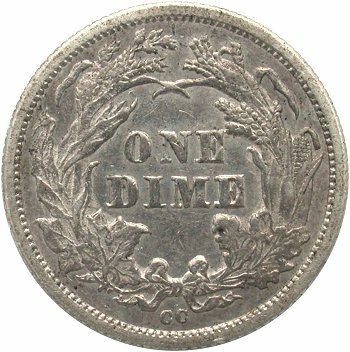 His dime is in an interim die state as compared to the elusive terminal die state (shown immediately below Jack's dime). The interim die state dime exhibits lighter die state cracks through the date and into left denticles and thoughout the left and right stars into Liberty's head. Amazingly, it was Jack White who discovered the terminal die state back in 1994 and sold the author the above dime afterwards. From these two specimens, we know that the obverse shattering might have been progressive rather than a swift terminal die event. If progressive die cracking is the explanation, then why has it taken Seated dime specialists so long to identify an interim die state example? During August 2013, the author located a 1856-O dime variety which was the first incremental die pairing since the web-book release in 2004. Obverse 6, previously employed to strike Medium O dimes, is paired with a very late die state Reverse A. 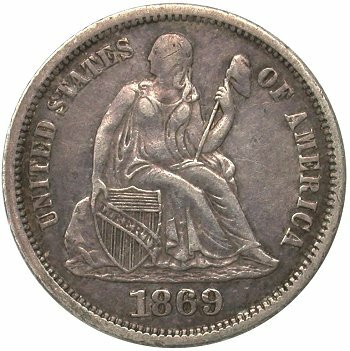 The Large O reverse was previously seen paired with the 1856 repunched up date obverse and could be characterized by its strong die lines from UNITED to the rim. During the Variety 109 die pairing, the Obverse 6 die crack proceeds from Star 4 through Star 5 -7, Liberty's head, Star 8, the flag and ends at Star 9. The die crack exiting Liberty's head is bold as are the multiple die cracks surrounding Star 9. Reverse A is in an eroded late die state. The die lines between UNITED and rim are quite muted due to die erosion. This new variety is initially listed as R6. Dr. Tim Cook, our Liberty Seated dime varieties specialist, offers an 1891-O dime with a misplaced 1 digit in the base. If one looks carefully in the base below the end of the scroll, the upright of a 1 digit is visible. This die pair is labeled as F-123 and we have a complete die progression through F-123b where the reverse shatters and exhibits a huge die cud from 9:00 - 10:30. This is the second incredible Seated dime submitted by Scott Grieb at the 2013 American Numismatic Convention. This 1877 Carson City dime with a Type I reverse resides in PCGS OGH and is clearly under graded. The reverse die has die crack patterns that I have never seen before on a Liberty Seated dime. I have named this reverse as the Lightning Bolt die crack reverse due to the multiple die cracks from the left wreath, through (O)NE and above ONE. A traditional die crack is also quite visible in the ribbon bow and through the lower right wreath. Finally, the reverse denomination is sharply doubled on ON(E) and DIM(E) along with irregular positioning of the individual letters. I am pleased that Scott provided the 1876-CC and 1877-CC dimes for inclusion into the web-book. During the 2013 American Numismatic Convention, Scott Grieb visited the Rare American Coins table and offered several important Seated dimes for the web-book variety documentation. Of keen interest was this 1876 Carson City plate coin with a very late die state Reverse K. The Variety 115a parallel die breaks in the lower right wreath have become one massive die break and that break is well defined due to the dime's high grade. In addition to the die break, the same dime has a sizable die cud at the rim between 5:00 and 6:00. This die is strictly original and grades AU. This late die state variety is rare (R6+) and appears much less often than the popular Double Die Obverse, Repunched 18 and Misplaced Date varieties. After years of reviewing Liberty Seated dimes, I have trained my eyes and follow a certain procedure for checking all new dimes for misplaced dates, date repunching and rotated reverses. During a recent inspection of some common date dimes, this 1889 was found to have a nice misplaced 9 loop in the gown at the top right of the pendant. Misplaced date digits are not typically seen so high up in the gown folds. There are still more undiscovered varieties and die states out in the market just waiting to be located and classified. Happy Hunting everyone. During April 2013, David Poliquin contacted me concerning an 1876-CC Double Die Obverse/Level CC Mintmark dime with a significant die crack in the left wreath. After receiving and inspecting the dime, the bold die crack was directly matched to that of an earlier die state already published as Reverse E.2 for Variety 112. I was able to match the severe die crack between 8:00 - 9:00 and also the die crack through the top of the CC mintmark which confirmed David's dime was a later die state. However, one important question does remain. Why did the Carson City mint interrupt the Variety 106 die pairing (Double Die Obverse with Level CC Mintmark Reverse) to pair Reverse E with another obverse die and misalign the obverse and reverse dies during that pairing (See Variety 112)? After the Variety 112 die pairing, Reverse E is in a later die state and once again paired with Obverse 5 to produce the above striking. More research is required to locate a higher grade example of Variety 106a to examine the Obverse 5 die state and determine the emission sequence for Obverse 5 and Reverse E.
After researching 1875-CC IW dimes for many years, one can still be surprised by a discovery. While visiting central Maine coin shops for new Seated dime inventory, the above dime was located. 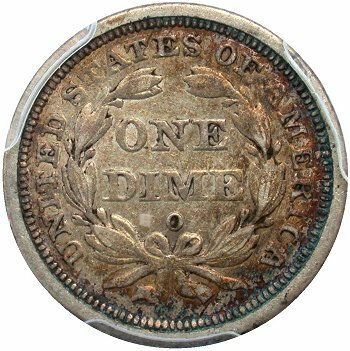 The dime was struck with Obverse 7 which is approaching or at terminal die state and is paired with an early die state In Wreath Reverse D. The obverse die cracks are quite severe with raised shelf metal through the flags of the 7 and 5 digits. The die is also shattering to the left of the 1 digit with what appears to be a strip of raised metal. Reverse D is in an early die state without die cracks. The die features a CC mintmark that is positioned low and far right. The distance or spacing between the two C's is considerable, but not as large as that of Reverse H commonly known as the "Wide CC Mintmark" variety. There are several soft die scratches in the upper left wreath at approximately 10:00. This die pairing and Obverse 7 terminal die state is initially listed as R6. The 1852 F-112 die pair is known for die cracks with Reverse L having a horizontal die cracks from UNI(TE)D through the left wreath, DIME and exiting into the right wreath. A secondary die crack at (UNIT)ED is also known. As Reverse L degrades further, that die crack becomes more severe with the edge of the die badly cracked and resulting in a partial cud with nice metal shelf at (UNIT)ED. The plate coin is the first seen with partial cud and listed in the web-book as F-112b. Since publishing the web-book in 2004, there has been no mention of a late die state (LDS) for the F-101 die pair. But considering that other 1842-O dies were often lapped and used until terminal, then there is a high probability of F-101 LDS. I bought a dime during July 1988 initially judged as candidate for an F-101 very late die state due to flat stars and Liberty on the obverse and wreath leaves on the reverse. But the dime had depression marks in the lower shield and gown area. I was unsure if those marks were mint induced or post mint damage. My gut said mint induced but could not prove due to lack of confirming example and general knowledge of filled dies at that time. The dime was put away in the bank for nearly 25 years assuming I would arrive at the answer eventually. At the Winter 2013 FUN show, a confirming example was located with similar obverse depressions and flat obverse devices. Then in the May timeframe, Dave Lawrence offered another specimen with flat obverse devices but without any obverse depressions. This nicely toned dime sits in a PCGS VF35 holder. By locating these two pieces, the puzzle surrounding the 1988 purchased dime was solved. The dies encompassing F-101 were indeed lapped resulting in strikes consistent on three different coins. The Dave Lawrence example becomes the F-101a plate coin and represents the lapped obverse/reverse die state. While striking additional coinage with the lapped dies, the New Orleans mint suffers a filled die problem on the obverse resulting in F-101b examples. F-119 is new designation for an 1886 dime with misplaced ball of 6 digit between two denticles below the final date punch. This is another submission from Dr. Tim Cook and indicates his incredible attention to details in the denticles for any type of anomaly. Good luck to anyone who tries to cherrypick this one on eBay! 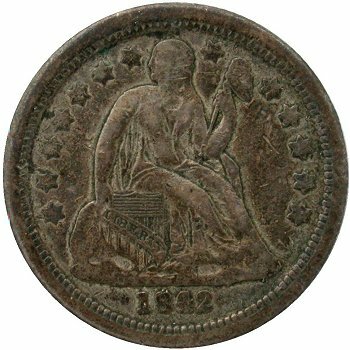 1841-O F-112a is new designation for the late die state Obverse 8 and Reverse F die pairing when the obverse die develops a rim cud at 8:00. The cud is likely to wear down quickly so 1841-O dimes grading EF or better are probably the best candidates for locating the F-112 terminal die state. This die state was discovered by Dr. Tim Cook and submitted in early 2013 for publication. At the March 2013 Whitman Baltimore show, the author located an early F-107 die state example in Mint State. Initially, I thought this to be a new MPD discovery but upon checking the web-book, I realized this was a very early F-107 die state with much more shield details. The new specimen exhibited deeper shield relief and revealed the bottoms of second 8 digit and new 1 digit above the previously listed doubled 8 bottoms. The base of the incremental 1 digit is more evident than that of the second 8 digit. In total, the shield contains four extra misplaced digits! Variety 111a is another rotated reverse occurence in the Liberty Seated dime series. Reverse H is rotated approximately 55 degress left during the Obverse 8 and Reverse H die pairing. This die state was first identified by Jason Feldman at the 2013 Spring Whitman Baltimore Coin Expo. The above plate coin is the discovery specimen and the only example known though others will probably appear now that the die state's existance is revealed. 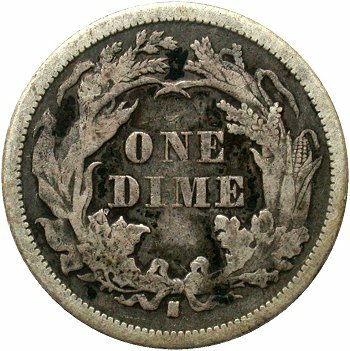 While attributing and photographing a group of consigned dimes for the Rare American Coins for sale list, an 1837 F-103a dime was identified to have normal reverse die rotation. After the author photographed the obverse of the above dime, the reverse image was expected to be rotated left by 23 degrees as is known for the variety. However the dime had normal reverse die alignment and was a significant discovery for a Top 100 Varieties date. The new reverse position variety has been labeled as F-103b in the web-book. During February 2013, Chris Majtyka informed the author of an 1860 dime with significant obverse rim cud at 10:00. This obverse is designated as Obverse 11 in the web-book. The date position is nearly identical to Obverse 9 which has a repunched date. 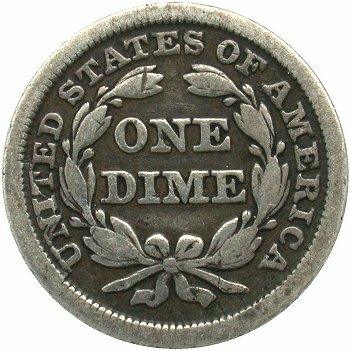 At first, the attribution of Obverse 11 considered that it might be a later die state or lapped die version for Obverse 9. However, from Chris' plate coin, there is insufficient evidence to make a firm conclusion. Therefore this variety is listed separately for the time being. During early January 2013, a well known eBay seller posted an 1875-CC Below Wreath dime in original condition with an obvious reverse die rim cud between 5:30 to 7:00. The eBay listing was the first time the author had seen a later die state for the F-108 variety. 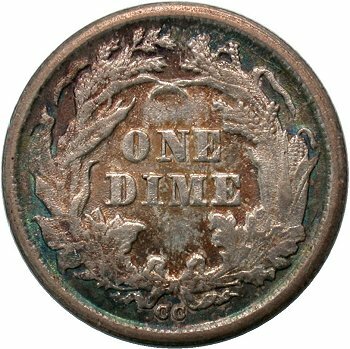 After spirited bidding between the author and one other individual, the dime was purchased for analysis and inclusion in the web-book. Little was known about Reverse E as it is only paired with Obverse 7 but this acquisition indicates that Reverse E die was most likely retired after striking dimes with a large rim cud. Obverse 7 goes on to strike more coinage and is paired with two other reverse dies. At the 2013 FUN show, the author discovered an 1887-S dime with an MPD 1 digit in the shield. My good friend John Frost was working at Bob Harlow's table and presided over the examination of an 1887-S dime which was promptly bought due to an extra flag of a 1 digit in the shield. No misplaced date digits were known for 1887-S dimes until this variety appeared at the FUN show..
At the 2012 FUN show, Jim Smith from Newport News, Virginia presented a group of new Liberty Seated dime varieties for inspection and potential inclusion into the Seated dime web-book. Jim is an avid variety collector and has an excellent eye for undocumented varieties. This 1883 variety is easily identified by a misplaced top of 8 digit in the denticles below the second 8 date digit. If one looks carefully at the denticles to the left of the misplaced 8 digit, there is the possibility of an additional misplaced digit below and between the two 8 date digits. On the plate coin, the 18 date digits are weaker than the 83 digits with the 3 digit being the boldest. This observations suggest the date punch was not fully perpendicular to the die's surface when the date was added. A third Small S die variety was identified by the author during October 2012. This variety is a new die pairing with Small S Reverse D. After being paired with Medium S reverse die (Reverse E) and suffering some degration, Obverse 4 is paired with Small S Reverse D to produce additional coinage. The obverse die crack from Liberty's foot and through AMERI(CA) well matches the die state on Variety 106a listing. No cracks are seen on Reverse D during this pairing. Therefore it is assumed that Reverse D was first paired with Obverse 4 followed by a second pairing with Obverse 3. During the Obverse 3 die pairing, Reverse D begins to exhibit die cracks. As a result of locating the Variety 118 plate coin and its diagnostics, I have renamed the Reverse D die states as "D.2" when paired with Obverse 3. Dr. Tim Cook has done it again! Tim submitted an 1887 uncirculated dime with repunching above the 18 digits. Reverse diagnostics are also present with a poorly hubbed reverse working die and irregular DIME letters in the denomination. Note the partially missing left foot of DI(M)E.
Sean Shaughnessy submitted an 1891-O dime with significant reverse die cud. This obverse/reverse combination was previously listed as F-119 with the Reverse R already showing severe cracking on the left wreath to rim. After receiving Sean's specimen, we can document the terminal Reverse R die state with edge metal loss between 8:00 and 9:00 producing a significant die cud. The lower right die crack between 3:30 and 4:30 is slightly more pronounced on the plate coin. Sean Shaughnessy publish this F-119 terminal die state on the LSCC message board in late April, 2012 and was asked to submit the dime for inclusion in the web-book. Until early 2012, the author only had evidence that 1875 CC In Wreath F-112 Reverse H examples were struck from a reverse die with a left ribbon end anomaly and with 113 reed standard collar employed at the Philadelphia and San Francisco mints. During February 2012 while conducting Liberty Seated dime contemporary counterfeit research, Chris Majtykas identified an F-112 specimen with 113 reeds and no reverse die anomaly. This finding is significant and provides evidence that the transition from the old style 89 reed collar (used to strike the 1871 through 1874 Carson City dimes) to the standard 113 reed collar was not related to the reverse die anomaly found on nearly all F-112b examples. Due to the discovery by Chris Majtykas, I have renamed the 1875-CC IW F-112 die states as follows: F-112 is Obverse 9 paired with Reverse H and 89 reed collar, F-112a is Obverse 9 paired with Reverse H and 113 reed collar and finally F-112b is Obverse 9 paired with Reverse H.2 die state with reverse anomaly on lower left ribbon and 113 reed collar. Checking the Heritage 2012 FUN online catalog, I noticed an 1884-S dime graded PCGS MS64 as a possible PCGS registry set upgrade. Futher inspection revealed the die pairing to be different than the four previously listed in the web-book. Therefore purchasing this dime was a priority at the Thursday afternoon auction and is listed as F-105. On this high grade example, Obverse 1 is found in an early die state and paired with Reverse C. The 8 and 4 digits are very close and do appear to touch as is the case for F-101. A later Obverse 1 die state is known after being polished; see F-102. On Reverse C, die cracks are seen from the right ribbon end through the mintmark to the rim and through the lower right wreath. The Small S mintmark is more blob like in appearance than the well defined mintmark on the F-104 reverse plate coin. However mintmark size and position do appear identical. At the 2012 FUN show, John Frost and I were manning the joint BCCS and LSCC club booth. Jim Smith from Newport News, Virginia walks up to the booth and drops a group of new Liberty Seated dime varieties he's discovered during the past few years. Jim is an avid Seated dime variety collector and has an excellent eye for the undocumented. The most exciting new variety in Jim's group is this 1889 dime with obvious misplaced 1 and 8 digit tops in the shield. How this MPD variety could have gone undetected for so long is a mystery. The tops of misplaced 18 digits are clearly visible in the lower shield. The flag of 1 digit is located between the bottom of shield line #2 and intersecting shield line #3. The top loop of 8 digit bisects shield lines #7 and #8. I've designated Jim Smith's new variety discovery as 1889 F-126. Great job Jim! During June 2011, Sean Shaughnessy identified a new 1875-S BW rotated reverse variety with the reverse die rotated 80 degrees left. The obverse and reverse die pair does not match that of F-109 and is therefore not a different rotated reverse position for that variety. Identifying the individual obverse and reverse dies is difficult due to the low grade of the discovery coin, therefore the variety is listed as a new obverse and reverse die pair for the time being until a high grade specimen surfaces and a more definite assessment can be made. At first, one might think that the mintmark is a Small Filled S however, careful checking of images between 1875-S BW Reverse Q and Reverse L led to the conclusion that Reverse Q has a typical Small S mintmark with substantial wear flattening its appearance. Clearly more research is need to properly diagnose this new variety and hopefully the F-118 listing will help locate other specimens for additional research. During the 2010 January FUN show, I ran across another 1876-CC dime with really soft device elements due to badly rusted dies. However, the date and mintmark positions did not match either the F-107 Double Die Obverse or the F-108 Double Die Reverse listings. Therefore, I had located another 1876-CC in very late state and purchased it for later study. Fast forward to June 2011 and I have been able to match the characteristics to the F-131 Pimpled Obverse Die variety. 1876-CC continues to be a date of interest to variety specialist since new discoveries are possible. During May 2011, I received an email from Dale Miller indicating that he had located a later F-115 Reverse N die state with two potential cuds. We made plans for shipment of the discovery coin during early June for photography and inclusion in the web-book. The later die state Reverse N has substantially degraded with heavy diagonal die crack down through the right ribbon end and through the mintmark to the rim under the left ribbon end. Two potential die cuds are forming at the opposite sides of lower reverse. The first is evident between 4:00-5:00 and the second between 7:00-8:30. The extra ball on the 9 digit is difficult to see on this lower grade specimen though the date position well matches the F-115 variety. At the January 2011 FUN show, Larry Briggs invited LSCC members to view an 1842 Seated dime that he suspected might be a proof but did not match the date placement characteristics of F-108. For reference, the F-108 date placement measurement is DR 0B1. I visited with Larry at his FUN table and upon inspection of the 1842 dime noted that the die pair was not that of F-108 but of F-106. Attributing 1842 die varieties by date position alone is difficult due to limited variation in date punch placement. However, F-106 can be easily diagnosed by nearly horizontal die lines behind Liberty's right elbow on the obverse and a subtle horizontal die scratch between the left wreath and bow on the reverse. On the Larry Briggs F-106 specimen, the obverse and reverse fields are a result of polished dies. Most interesting is the lack of continuation of the horizontal die lines through Liberty's elbow into the right field. Rather, those lines are removed as a result of a polished depression in the die's surface in that area. The depression is well visible starting at the right shoulder, through the pole and into the right field. This die characteristic has not been seen on F-106 business strike examples to date. The reverse die was confirmed to be Reverse E as paired with Obverse 5 due to the still visible horizontal die scratch between the left wreath and bow. I have designated the polished die state as F-106a. I asked Larry to borrow the 1842 dime for further study and for inclusion in the web-book. Of importance is the question of whether this 1842 specimen is an intentional proof strike or the result of a random die polishing event. Please see the February 2011 E-Gobrecht issue for more information and an opportunity to render your opinion. The repunched right C mintmark on Variety 133 is quite significant and was first identified by Harry Smith and published in the July 2010 Gobrecht Journal issue. Variety 133 exhibits many obverse and reverse diagnostics that should facilitate easy attribution. Obverse 26 is characterized by a medium level date with small knob 6, a visible die line through the lower right shield and a fully broken (O)F.
The repunched right C mintmark on Reverse Y is most obvious at the top of the mintmark with extra metal that appears to be a horn. Additional repunching is seen inside the mintmark. The denomination is doubled, stronger on ON(E D)IME as an additional diagnostic. There are parallel die lines between the left wreath and the left ribbon end as illustrated. The fifth Short Flag 1 die pairing was brought to my attention by Dr. Tim Cook during June 2010. I was quite surprised to see a fifth Short Flag 1 obverse die surface after extensive checking of all 1869 Short Flag 1 dimes that crossed my path. The new die pair is labeled as F-107. The Obverse 7 date punch is bold, especially at the top flag of the 1 digit. The date has a slight upward slope with the 1 digit evenly spaced between the base and denticles. The first S in STATES is partial as compared to fully broken S on other Short Flag 1 obverse dies. Reverse G is also a new discovery with an obvious die line through (D)IME which extends into the left wreath. During March 2010, the author received an email from Rick DeSanctis, a Ft Myers, Florida dealer, who stated that the F-107 and F-108 Obverse 6 date punch was actually an overdate on an original 1876 die. Rick indicated that the remains of a 6 digit could be seen on the top surface of the crossbar of the second 7 digit consistent with the 1877, 7 Over 6 Liberty Seated Half Dollar listed in Cherrypickers' Guide as FS-50-1877-301. The dime was sent to the author for verification and photography. The remains on the top surface of the 7 digit crossbar were imaged with the dime placed on a mylar wedge to properly adjust lighting angle and capture the anomaly on the top surface of the 7 digit. The anomaly does have similarity with the top loop and Small Knob of a 6 digit. This anomaly will wear quickly, therefore mint state examples of F-107 and F-108 should be examined for the possibility of a full top loop of the 6 digit protruding from the surface. F-107 mint state examples with an early die state Obverse 6 should be the best candidates for inspection of the 7 over 6 overdate variety. At this time, Obverse 6 is updated to be an 1877/6 overdate variety. More mint state examples of F-107 and F-108 are requested from collectors for additional imaging. Kam Ahwash listed this variety as 1876 Type 2 Reverse A-6 in his encyclopedia but provided no pictures. He also stated that the variety had a Small Knob date punch obverse with a repunched 1 paired with a Type 2 reverse. Since Ahwash provided no plate coins for his A-5 through A-8 Type 2 varieties, locating and organizing corresponding plate coins proved to be a long journey. I located an example of Kam's A-6 variety during 2009 which completes the illustration of all Ahwash 1876 Type 2 reverse varieties (A-4 through A-8). The repunching above the flag of the 1 digit is evident and is possible to see with a 10X or better glass. Type 2 Reverse C is substantially cracked and mapped within the corresponding page inside the web-book. This 1875-S Below Wreath variety is yet another die pairing between an early die state obverse and well worn reverse die. Obverse 15 is well struck and strongly clashed and also exhibits portions of a misplaced digit to the right of the pendant. I believe the misplaced digit is the lower right loop of the 8 digit. Tim Cook discovered the misplaced date on the plate coin and submitted the finding for publishing in the web-book. Reverse O is extremely worn, cracked and lacking details in most wreath elements. The right corn ear details are nearly eliminated. See the enhanced mapping of the reverse die cracks above as a finger printing of the die for differentiation with other similar late die states reverses. Until January 2010, no examples of Obverse 3 without the bold rim cud from Star 3 to Star 5 were reported or published. The date positions on Varieties 103a, 105 and 106 are all similar, complicating the task of finding and diagnosing an Obverse 3 example without the characteristic rim cud. Reverse C features an abundance of die lines when paired with Obverse 3 and its rim cud. A large series of parallel die lines originate from the right rim into AM(ERICA). Another significant die line passes through the (S)TATES. During early February 2010, Tim Cook sent along the plate coin for confirmation as the first identification of Variety 103 without the characteristic 10:00 rim cud. The search was over and Tim is congratulated on the acquisition of such an outstanding example as the discovery piece. The obverse is prooflike and quite reflective with date punch position matching that of F-103a. The date digits on Obverse 3 are well punched with the 84 digits touching. The reverse is also prooflike but less reflective than the obverse. The reverse die lines through AM(ERICA) are sharp with one die line extending through AM(E)RICA, then wreath and nearly touching ON(E). The die line through (S)TATES is also visible. The date placement on this obverse (Obverse 7) is nearly identical to Obverse 2 but is slightly more left on Obverse 7. Both obverse and reverse dies are strongly clashed. Obverse 7 die clash marks are different than those on Obverse 2, another diagnostic point. Reverse G is strong clashed in right area between denomination and wreath. Take care in attempting to diagnose Obverse 2 and Obverse 7 dies as the author assume that both dies were one and same for a number of years until Tim Cook provided this heavily clashed example to clearly identify the new F-107 variety. Reverse C is found in a late die state with emerging die cud from 1:00 to 2:30. A large die crack is also seen exiting to the rim at 9:00 after passing through the adjacent maple leaf. This dime was part of the Tim Cook collection sold during the Heritage 2005 CSNS auction and most likely was part of the cud collection sold to Tim by Larry Briggs. I bought the dime at the Heritage auction as part of a larger lot and failed to capture the die cud in the web-book until December 2009. 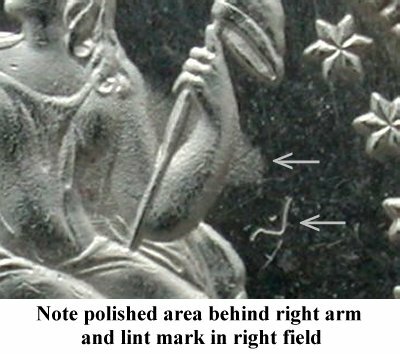 While Obverse 1 is paired with Reverse B, strike doubling is once again evident per the discovery dime submitted by Dale Miller in late December 2009. Dale noted that his 1857-O dime with strike doubling was not paired with a shattered reverse (Reverse A) but rather Reverse B with the die spur on (O)F.
Though the F-102a variety does exhibit the strike doubling on the date and stars, it does not quality for the Top 100 Varieties set. To be eligible for inclusion, the variety must be F-101 with obverse strike doubling and the shattered reverse. 1857-O Reverse C was located in a later die state with the Large O mintmark exhibiting thicker sidewalls and a reduced center opening. There is an obvious die crack from rim through AMERI(C)A to wreath. The blob defect on the lower upright of ON(E) is not as distinct as during the early F-103 die state. This later die state reverse was first identified by Liz Coggan at JJ Teaparty during early 2008 and communicated to the author during the 2008 Summer ANA show. 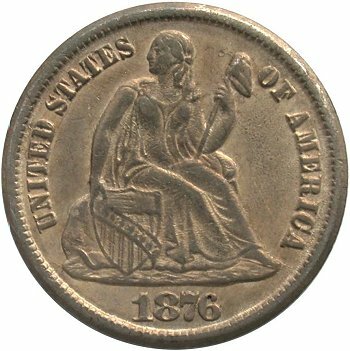 Liz set the dime aside due to the atypical reverse mintmark size for the 1857-O date. Another double die reverse die pairing was first identified by Dale Miller and confirmed by the website author. Variety 123 captures the pairing of Obverse 7 with Doubled Die Reverse #2. The only diagnostic for Obverse 7 is date position. Reverse E is categorized as Doubled Die Reverse #2 and its primary diagnostic is minor doubling on the outer left edge of (O)NE and strong doubling on the outer edges of the maple leaves and within the veins of the leaves. Look for the long die crack on the outer maple leaf as another diagnostic point. An early die state example of popular Double Die Reverse variety, with severely eroded dies, was located at the 2009 Summer ANA show. Obverse 6 and Reverse G are in early die states where sufficient device element detail is present on rusting dies. Die rust is evident throughout Liberty but especially in the shield and lower gown. The early die state allows date repunching to be seen under the 18 digits and between the 76 digits. There are die cracks from the left base and the foot to rim. Reverse G is already heavily rusted within the wreath elements. 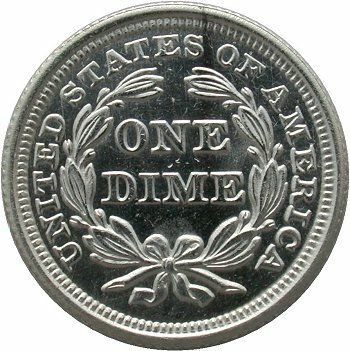 The denomination is strongly doubled at ON(E) and DIM(E). The top of a misplaced 8 digit is seen immediately to the right of the scroll end on this obverse 21. There are no other supporting diagnostics for this obverse die. This misplaced date variety was discovered during August 2009 by Dr. Tim Cook and is first announced in the web-book. This 1888 misplaced date variety was first announced by Dr. Tim Cook in the June 2009 E-Gobrecht issue. Obverse die features another significant occurence of misplaced placed digits. Two sets of 18 digits are easily seen in the lower shield with shield line #7-8 bisecting the 18 digits. Traces of extraneous digits are also visible on the lower gown area above and to the right of the pendant. 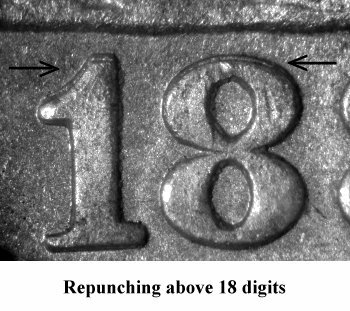 Minor repunching is also seen below the last 8 digit in the normal date punch. Also note the date position as an additional diagnostic point as the date punch is placed far left and has a sharp downward slope. During August 2009, Bill Mackrides, a noted collector and dealer in Seated coinage, contacted the author concerning the appearance of an 1845-O Huge O with a rotated reverse die. The reverse rotation was measured at approximately 25 degrees. Upon verification of the author's F-102 plate coin and another Huge O example graded PCGS EF40, it was confirmed that the Huge O variety is typically seen with normal die alignment. Further investigation with Jason Feldman, a specialist for rotated reverses in the Liberty Seated dime series, revealed that Jason published commentary in the March 2008 E-Gobrecht issue concerning the appearance of two 1845-O dimes with rotated reverses. At that time, he commented that the reverse rotation seen was typically 15 degrees for examples with the thick date and mintmark. The author has discovered a new 1841-O Medium O die marriage variety. Interestingly, the discovery coin exhibits an 1841-O Obverse 2 die paired with a lapped Medium O die that was only known to be used in 1842. I have labeled the 1841-O usage of the lapped Medium O reverse as Reverse N while it is labeled as Reverse F during its subsequent usage in 1842. Both 1841 and 1842 die pairings with New Orleans Reverse F are considered as an R6 rarity in grades of VF or better. An 1876 dime, with a reverse that is rotated left 85 degrees, appeared on eBay recently and was purchased by Jason Feldman. Jason was kind enough to consign his new acquisition for inclusion into the web-book. I've listed the variety as F-117 with the obverse die showing a large blob die defect above the shield. Does anyone have an example without the rotated reverse? During the 2006 ANA show, Jason Feldman discovered an 1854-O F-103 with a rotated reverse. The F-103 variety features an oblique O mintmark and a badly cracked obverse die between the 18 digits. The reverse is rotated right by about 50 degrees on Jason's coin. He was kind enough to consign the new acquisition for inclusion into the web-book. During early 2006, a Mint State 1869 Short Flag dime appeared on eBay. Finding an Mint State example of any of the previously known Short Flag obverse dies would be an important occasions for the serious seated dime specialist. As it turned out, the eBay dime was a business strike example of the F-104 proof only variety and was immediately purchased. Upon receiving the dime for inspection, it was confirmed that business strike examples of F-104 Short Flag can be located. I have listed the business strike as F-104a with an estimated rarity of R6 (at least for now). Tim Irwin has identified and purchased an 1874 WA dime that was struck with the same obverse die used to coin the extremely rare "No Arrows" 1874 variety. Interestingly, Tim's dime has a full left arrow and a missing right arrow. Tim was kind enough to send this 1874 dime along for study. My initial observations and conclusion? The arrows and date digits were obliquely punched into the working die from left (deepest) to right (shallowest). It does appear that the arrows and date digits were all part of a ganged punch. Check the detailed commentary at the 1874 WA F-114 listing.